Surgical therapy is necessary to alter the physical structure of the ear canal. Surgical therapy is recommended when it is apparent that the ear will have recurrent infections and that these infections will continue to happen until there is a change in the physical characteristics of the ear. There are three commonly performed procedures that can be used to accomplish our goal of creating a non-infected easily managed ear canal with minimal disfiguring effects. These three procedures are the lateral ear resection also called the Zepp procedure, the lateral ear canal ablation and the total ear canal ablation. This surgery is used in animals that have disease to the vertical ear canal with relatively little proliferative or hyperplastic changes to the outer ear canal. These pets do not have middle ear disease and all in all, have mild recurrent ear disease. The surgery opens the horizontal canal to the outside so that drainage and air circulation can occur. This reduces moisture in the ears and changes the environment so that wax and debris cannot accumulate in the ear canal. This surgery should be done on young animals to prevent the inevitable changes that are associated with chronic ear disease. This surgery is not a cure for more chronic or long standing ear problems. 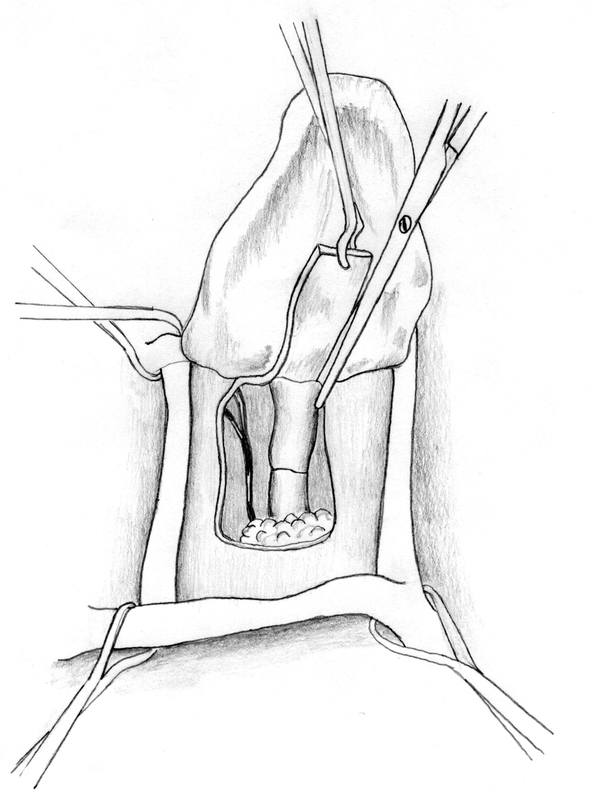 The surgery opens the horizontal canal to the outside so that drainage and air circulation can occur. This reduces moisture in the ears and changes the environment so that wax and debris cannot accumulate in the ear canal. Surgical treatment is usually indicated when otitis externa (ear canal infection) becomes unresponsive to medical therapy, a lateral ear surgery is recommended. Lateral ear resection is also indicated for frequent recurrence of otitis externa, for chronic otitis externa resulting from inadequate treatment or a lack of treatment. Lateral ear canal resection is also indicated for external ear thickening that does not currently obstruct the horizontal portion of the external ear canal (hyperplastic otitis), or for exposure and removal of small tumors or polyps. The goal of lateral ear canal resection surgery is to provide environmental alteration by means of ventilation so that moisture, humidity, and temperature are decreased. 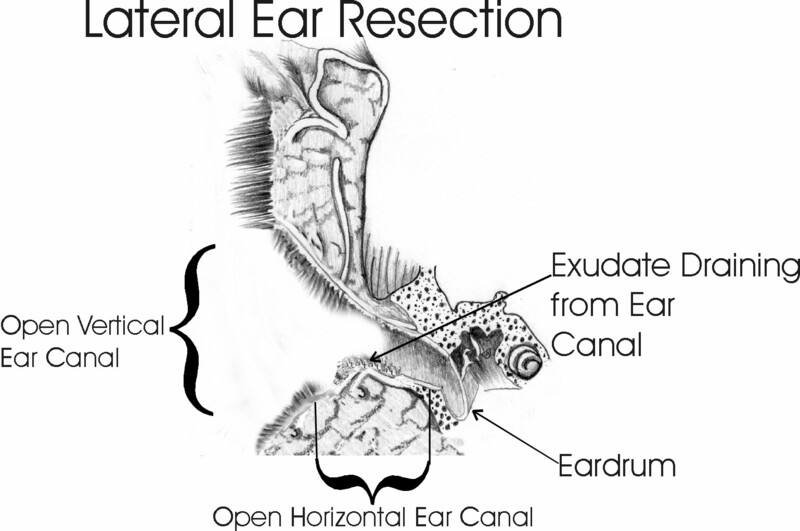 Lateral ear canal resections also provides drainage for exudates and moisture in the ear canal. The patient is anesthetized and placed in lateral recumbency, Two skin incisions that extend downward which are about 1.5 to 2 inches in length and run parallel to the ear canal. Then a cross incision is made joining the two incisions. 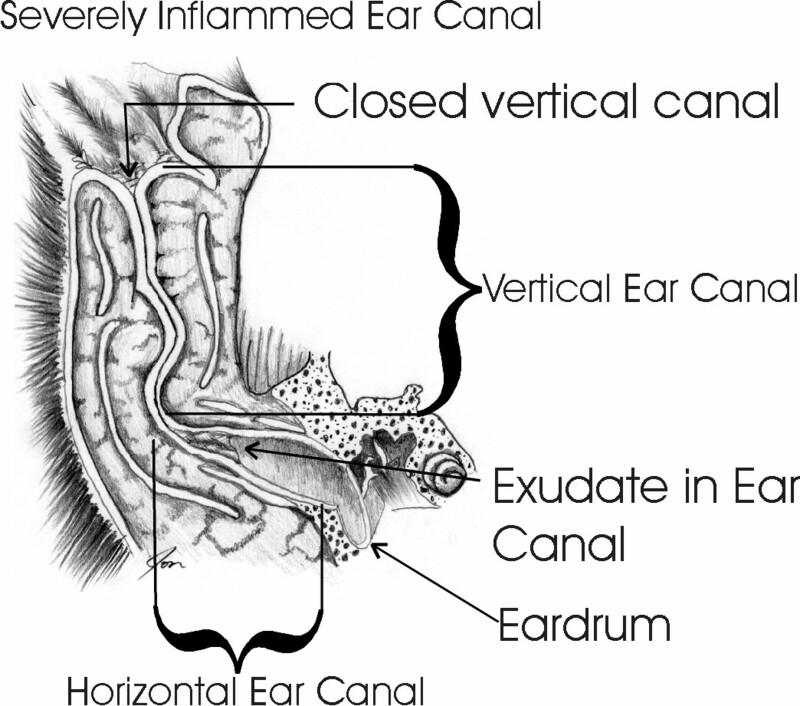 The cartilage of the lateral portion of the vertical ear canal is then opened along the same lines as the skin incision. The cartilage is folded ventrally and trimmed and sutured to the skin. This ventrally placed cartilage serves as a “drainboard” for exudate exiting the ears. Lateral Ear Resection 1. Surgical preparation and outline of the incision. Lateral Ear Resection 2. After the initial skin incision, the parotid salivary gland and major vessels are avoided while the ear canal is dissected. Lateral Ear Resection 3. 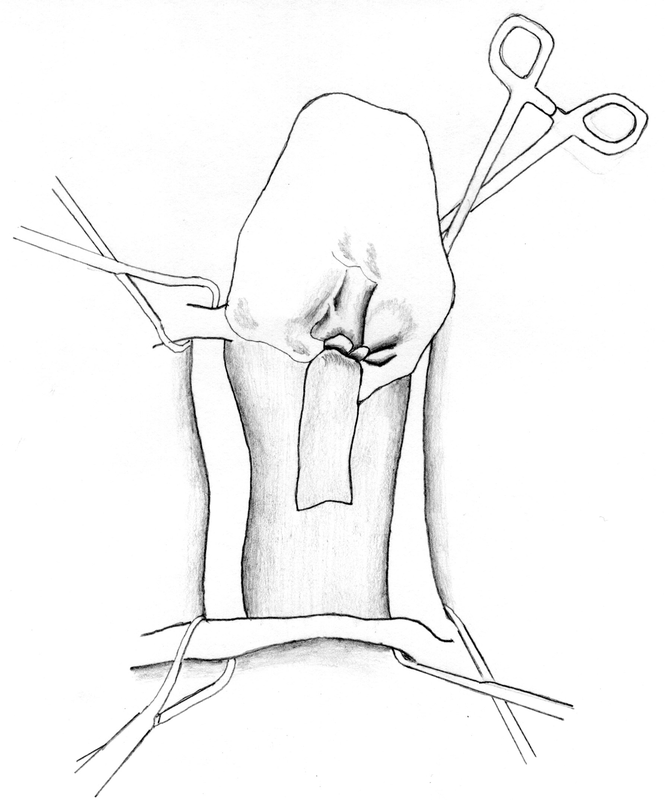 The finished resection provides drainage from the horizontal canal and a “drainboard” for secretions. Post-operative care includes treatment with the appropriate antibiotics and management of self-trauma and ear movements, bandaging may be necessary. Coping with the prolonged healing time may be difficult. The healing time averages between ten to fourteen days. If the suture line breaks down, the healing process may take a little longer. Hot compresses are usually recommended to help reduce the swelling and warm water and hydrogen peroxide is recommended on the incision lines. Topical medications may also be prescribed. Rechecks are done every few days to help monitor for any problems that might occur. 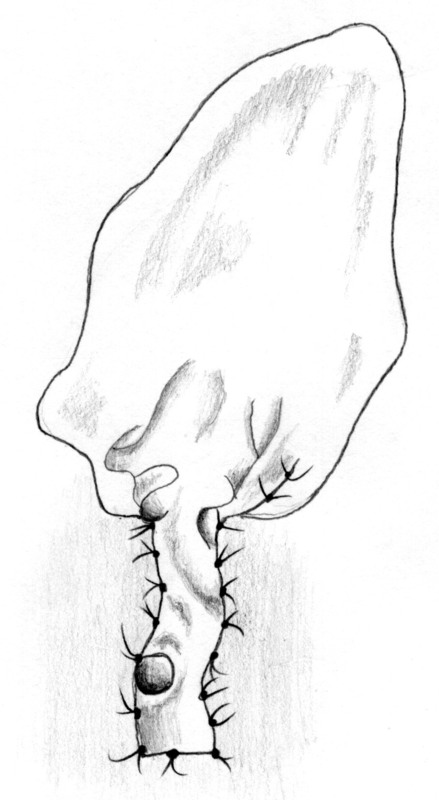 The suture removal is usually done under a light sedation.